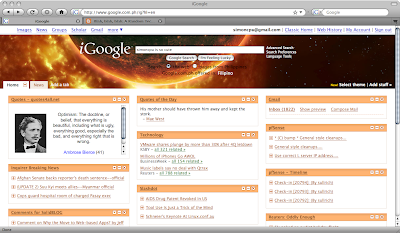 Okidoki, here's a screenshot of Firefox 3 beta 3 (?) in Mac OS X. I wonder why this version is called "minefield." Maybe it's because it'll explode anytime? I've switched to Firefox 3.0 beta 2 a couple of weeks ago because I've been frustrated by the constant lockups the browser gave me. Firefox was fine when I first started using it around version 0.x - 1.x. Sure, it did have some security issues, but the development team would quickly fix it up as soon as they were discovered. Much (virtual) ink have already been spent discussing this issue on other forums, so there's no need to enumerate my problems here. Firefox 3 beta 2 is cool, and I no longer experienced constant lockups unlike before. It would crash, yes, but only rarely. Too bad the Web Developer extension isn't available yet on Firefox 3. Anyway, I'll be trying the nightly Firefox 3 build (is it on beta 3 yet?) for Mac OS X. It apparently has a new look, but I don't know if it already has native Mac controls. They promised that the final version would have one. Oh well, I'll wait and see. I'm lazy. I'm often satisfied of simply knowing that I can do something if I want to, even if I don't actually do it. I'll try to blog at least 1 post per 2 days. This will be an exercise in organizing my thoughts in a manner that is understandable by other people. Contrary to common misconception, my internal thoughts are very organized; it's just that it's structured quite differently (I've learned this the hard way as I grew old), and some of my internal thoughts don't seem to exist in verbal and numeric form. They exist as symbols. Many of them exist as ideas that are not really ideas; they have this certain qualities that cannot be described with mere words. They are blah, blah, blah, and I think I have to stop introspecting now because this won't make sense anyway and I need to go home now. Typing my thoughts impromptu makes some very weird post. Oooh, there are updates on www.fsmware.com! Finally! :) Check out the FreeBSD/Xen wiki as well. I've been trying to install FreeBSD on a box with an ICH9 chipset to no avail. FreeBSD-CURRENT (the soon to be 8.0) doesn't seem to work either. There has been discussions in the mailing list that it works with FreeBSD-CURRENT, but it really doesn't work on my box. NetBSD seems to support ICH9 on 4.0, but I prefer FreeBSD over NetBSD. Oh well, I'll just download the ISO and see how it goes. If it works, then I'll try to replace the kernel with a Xen hypervisor. Our box has a whooping 250GB of hard disk space, and it's more than enough to run a few domU Linux systems. Hmmm... It'll also be an opportunity to run Plan 9 domU as well. I haven't tried that yet. I'm wetting my pants with nerdish delight now.